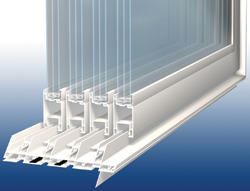 Veka’s FeneXseal is coextruded sealing technology, with flexible PVC coextruded into the internal chamber of the sill profile. A water-tight seal at the head and sill prevents penetration through the installation holes. The company says that the product can reduce energy costs, and help deaden ambient sound through the frame at the installation contact points. 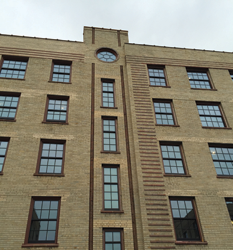 1600H Double Hung Historic Window by Wojan Window & Door Corp.
Wojan reports that its 1600H Double Hung Historic Window offers energy-efficient design, historic compliance and an installation method that allows the construction process to remain on schedule. The product’s U4 technology offers solar control and passive solar characteristics. 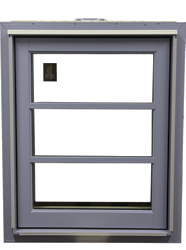 The Series 7600 features a design pressure rating of 50, and a thin extrusion profile with a section depth that supports triple-pane, laminated and security glass. The door features low-E, argon-filled dual pane glass and interlocking track designs that make it possible to fit wide openings with almost any number of panels, the company states. Weather Shield’s Automated Multi-slide Patio Door is a recessing door that can be controlled by a push-button panel on the wall or connected to a smart-home system. The system includes multiple sensors and a battery backup, can accommodate openings up to 50 feet wide and 10 feet tall and is available in single and bi-parting designs. The door panels slide open and can be designed to rest at the end of the track or hide inside a wall pocket. Finish options include seven custom interior wood species and custom-primed, painted or stained interior finishes. The door is also available in 12 standard and 45 designer exterior colors with eight anodized aluminum, 12 metallic finishes and custom options. Weather Shield reports that its Contemporary Collection Casement Hardware offers a smaller footprint with minimal, contemporary hardware that folds out of the way after use. The sash locks in multiple places, while the stainless steel Contemporary Casement Hardware is corrosion-resistant and available in seven finishes, including the newly-added Polished Chrome. 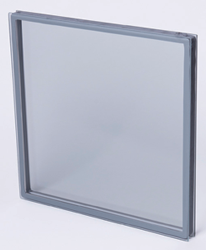 Sungate 460 glass is a clear passive low-emissivity glass formulated with a magnetron sputtering vapor deposition coating. Vitro reports that when window makers fabricate an IGU with insulating gas, a warm-edge spacer and Sungate 460 coated glass positioned on the third surface, the unit can be installed to reach Energy Star mandates. That helps manufacturers reduce material and production costs, they say, by eliminating the need to place low-e coatings on two surfaces (the #2 and #4 surfaces) of the unit to achieve equivalent Energy Star performance. Solarban 90 quad-silver-coated glass blocks 77 percent of the sun’s heat energy in a standard dual-pane residential window unit. Vitro reports that the glass blocks solar heat 15 percent more effectively than Solarban 70XL glass, the industry’s highest-performing triple-silver-coated glass, which the company, formerly PPG Glass, introduced in 2005. Solarban 90 glass combines triple-silver coating technology with a fourth layer of silver composed of discontinuous “plasmonic” nano-particles, engineered to absorb solar energy. Slide Clear reports that the CLR multi slide advances the idea of slimmer profiles and increased energy efficiency, creating wide open spaces and extensive flexibility. The CLR multi slide features integrated handles that blend into the stiles, along with a platform that enables panels to be stored on the right, left or in the center. 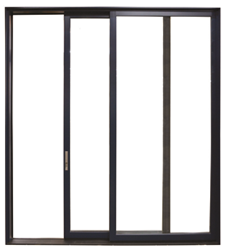 The door offers a standard triple-pane insulating glass unit, with U factors as low as .17 and solar heat gain coefficient of .20. Other features include standard triple-point locks, options including zero post corners, six panel configurations, and a range of motorization and automation options. Sierra Pacific Windows recently launched the Aspen 2.0 Collection, with performance ratings ranging from DP50 to DP65 for various models, and U-values of .30 with the standard low-emissivity 272/clear glazing option. Design features include a continuous foam weather-strip on the frame, an improved lock assembly, and a new ¼ inch steel plate option. A lock adjustment system reduces operating force in large units with more lock points, while interior stationary brackets allow for the removal of the sash with ease, and removable frame covers fastened with a “rigid coupler” attachment strip provide fewer nail holes to putty during finishing, the company states. 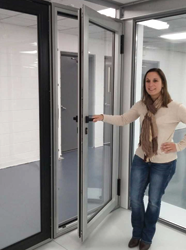 Reklo is a hinge with self-closing features that are consistent with the characteristics of a class-5 commercial door closer, the company reports. The Reklo offers 2D adjustability as well as dual closing/latch pressure and speed adjustments along with hold-open device features. Reklo can sustain weight loads up to 250 pounds.